View from the deck, 50 miles of ocean, facing west toward the sunset. Living area with 50-mile ocean views. 4+ person golf cart included! 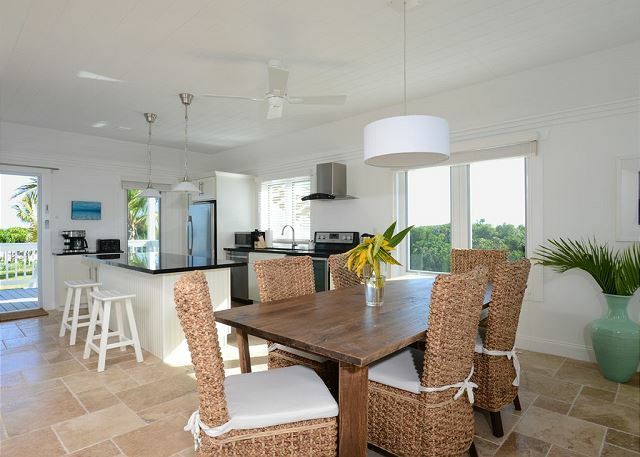 "Sapodilly" Vistas, Unit 1A at the Buttonwood Reserve Oceanfront Condominium Resort is a lower level unit, that includes a full-surround two-ocean view, facing west over the Caribbean for the sunset and east to the Atlantic for the sunrise. 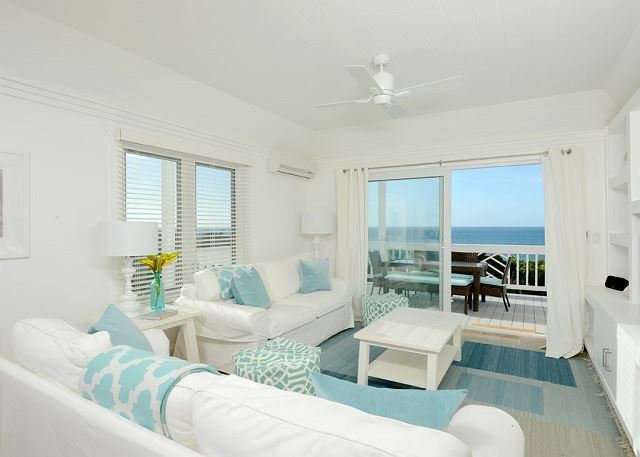 Enjoy stunning ocean views from every room through eight-foot glass sliders and six-foot bay windows. 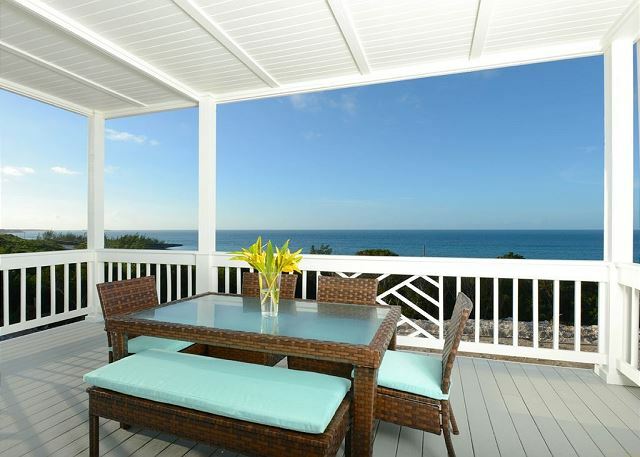 The expansive private decks also feature spectacular sea views in every direction. 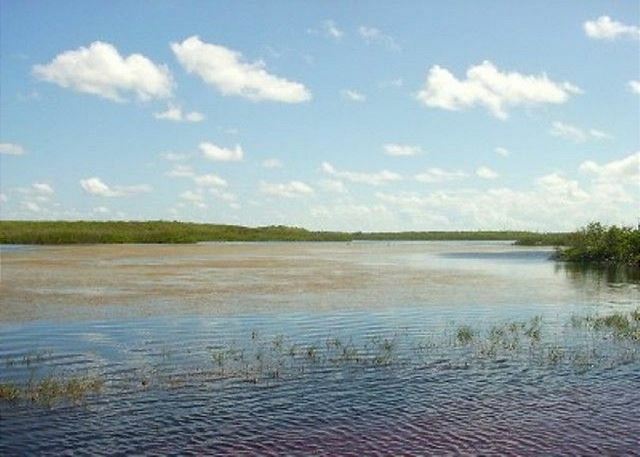 Buttonwood Reserve has access to two beaches. 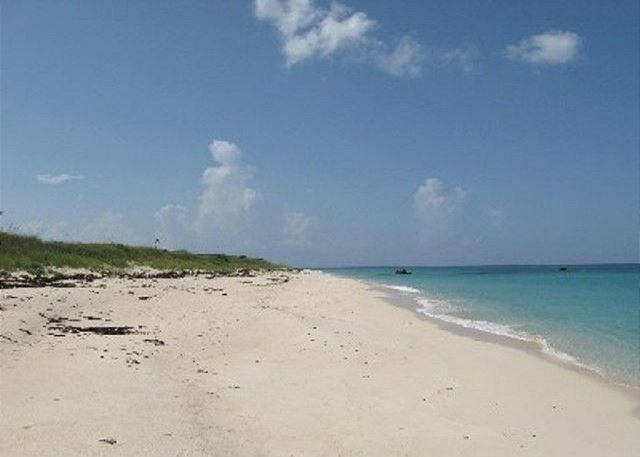 On the Atlantic side is a world-class, 3-mile-long pink-sand beach, pristine without a single house. 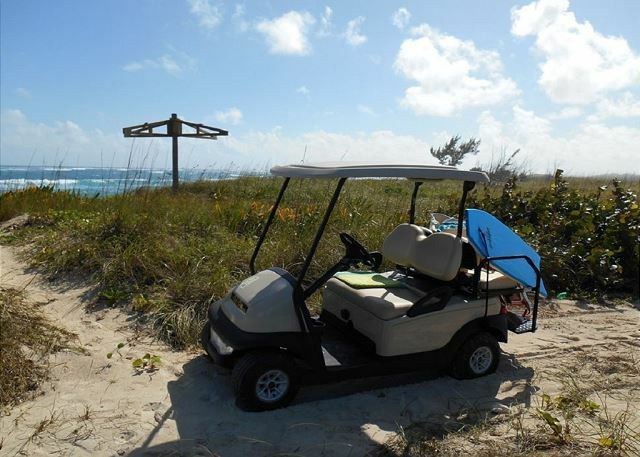 It is accessed via our private, golf-carts only driveway. The condominium comes with a golf cart. 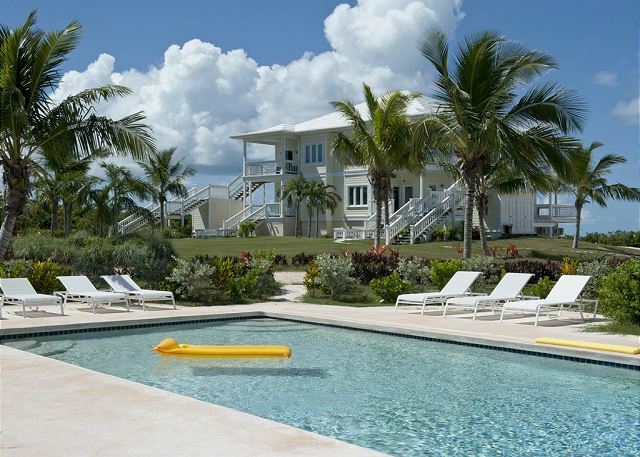 On the Caribbean side of our property, almost in your front yard, is a second beach. This beach is small and rather rocky, so not so aesthetic, but the water is as calm as a lake and this shore is perfect for snorkeling, kayaking, paddle boarding, and fishing. 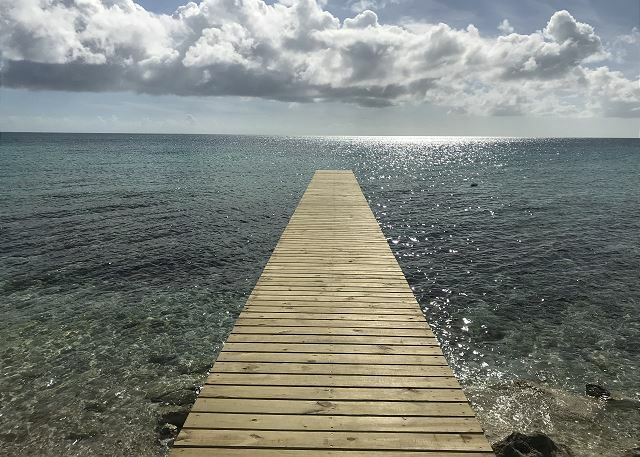 The Caribbean side also features our new 70 foot boat dock, a perfect for platform for jumping/diving, fishing, or of course docking a small boat. 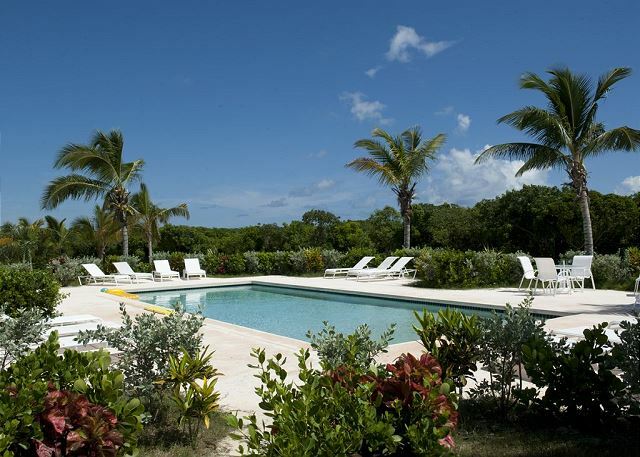 Our resort-style pool is just steps from your condominium. 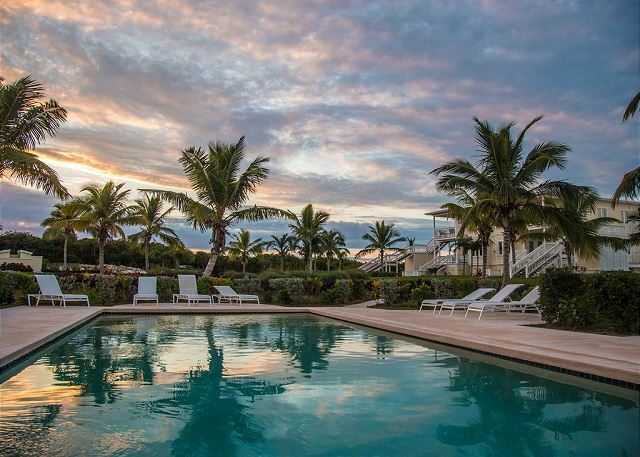 This beautiful landscaped pool is heated for comfortable swimming year round. 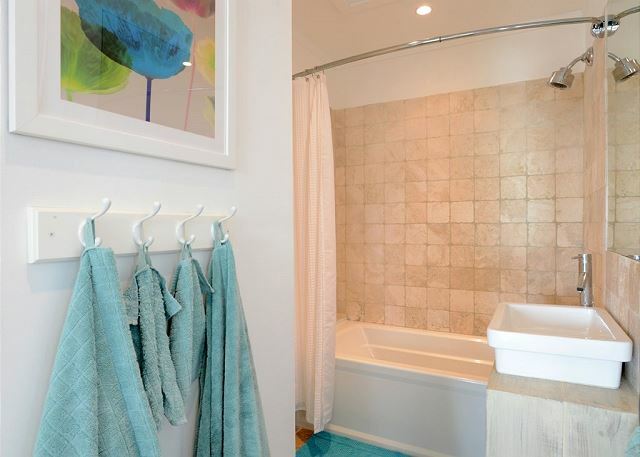 The professionally decorated interior of this vacation rental is elegantly furnished, modern, warm and comfortable. The east end of the great room features a modern, open-plan, luxurious kitchen finished in stainless steel and black granite. 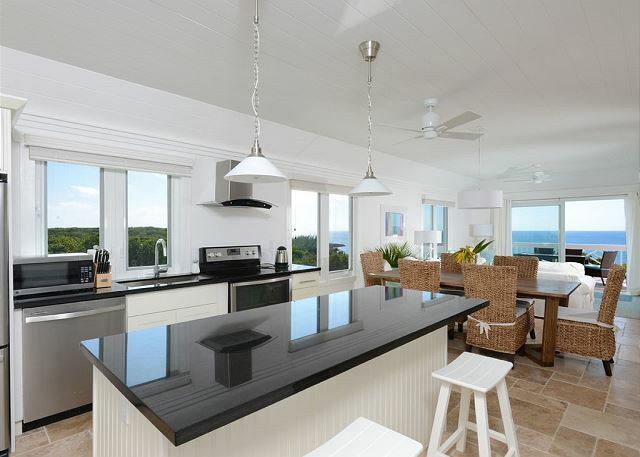 The kitchen, dining area, and living room have magnificent ocean views in every direction, with water sparkling as far as the eye can see. 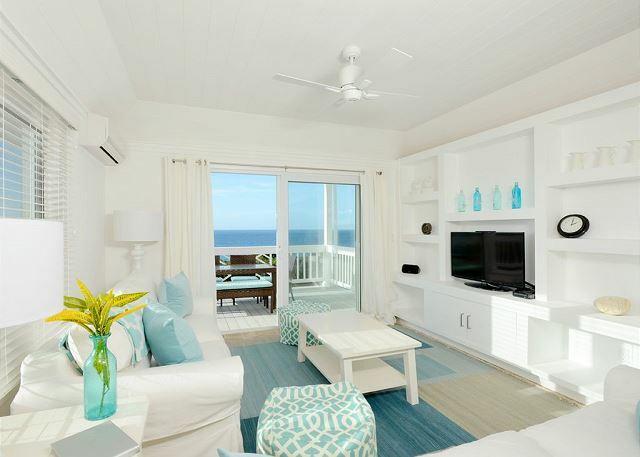 The master bedroom is features a large upholstered window seat with magnificent panoramic views of the Caribbean, a perfect spot to relax with a book or morning coffee, or watch the sunset over the sea. 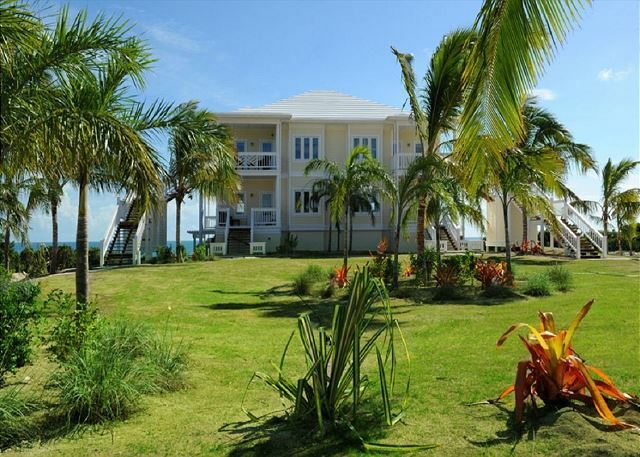 The master is furnished with a king bed and equipped with an en-suite full bath. 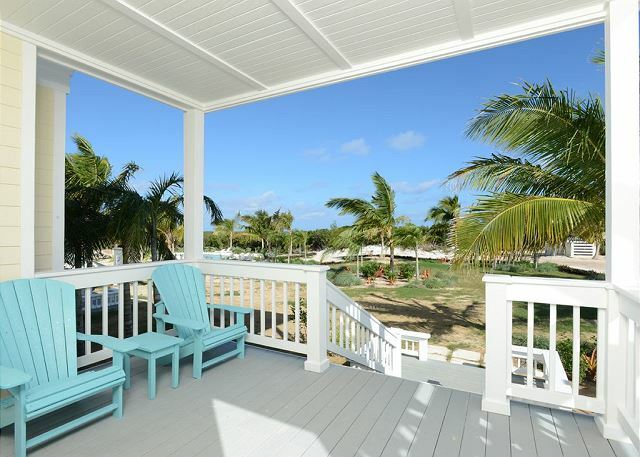 The master has a private door leading to the deck over the Caribbean. 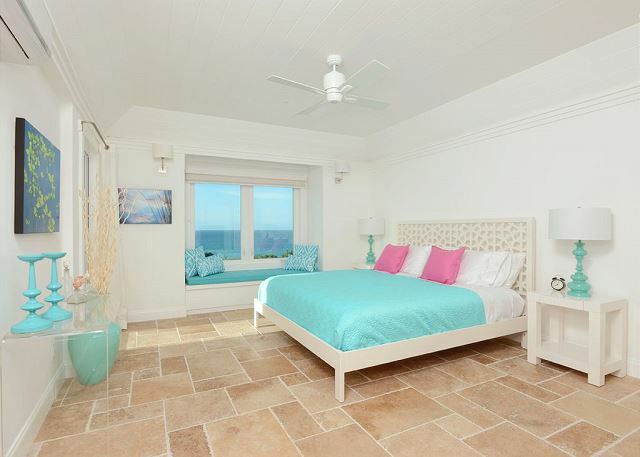 The guest bedroom also features a large window seat with a spectacular view, this one overlooking the Atlantic. 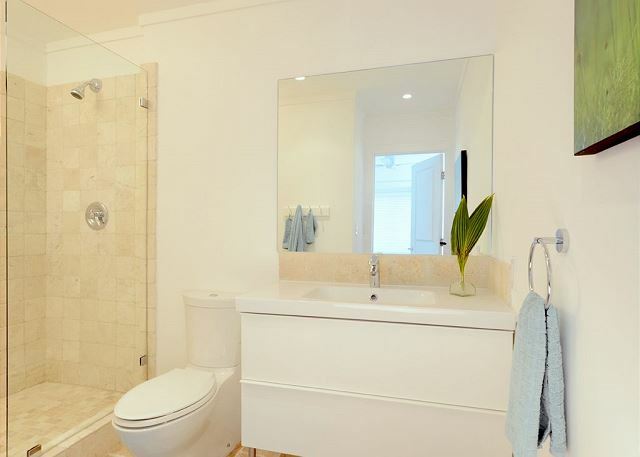 The bedroom has a full en-suite bath (which can be accessed from the hall as well). It is furnished with twin beds that can be converted into a king. Buttonwood Reserve comes with kayaks and a paddle board for use on the sea or in our pond. Bicycles are also provided for riding around the property or to town, less than a mile away. 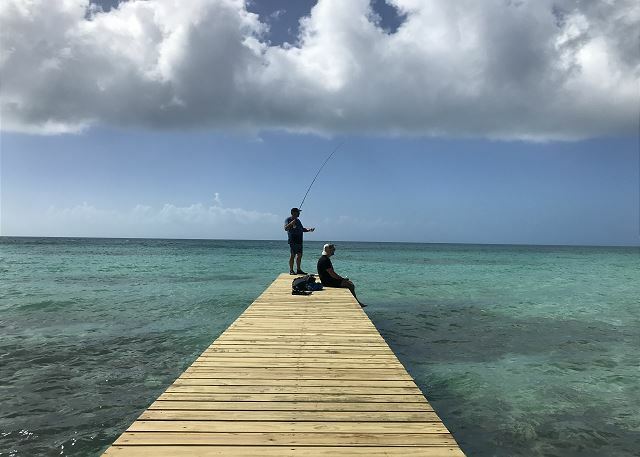 Our groundskeeper, Patrick, is an expert fisherman and will take you out fishing in his boat for a half day or full day (extra charges apply.) Grill your catch fresh on our infrared outdoor grill. 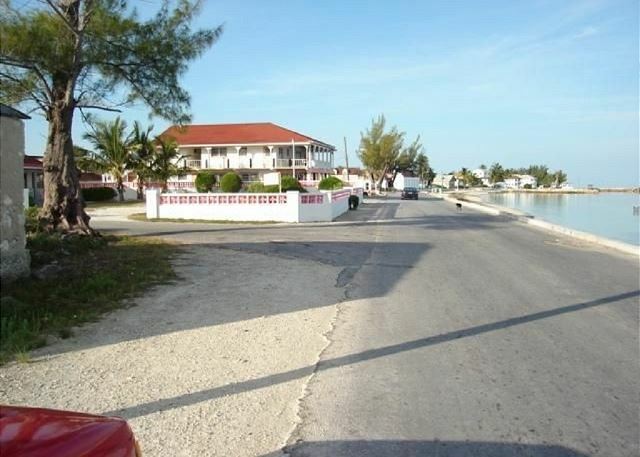 Buttonwood Reserve is an easy 15-minute drive from Governor’s Harbour, the main town on the island. Governor’s Harbour has a charming collection of 19th century homes and churches overlooking its historic harbor. Just a mile from Buttonwood Reserve is the village of James Cistern, which has two grocery stores, a town dock where the fisherman bring their catch every day, a produce stand, and three small local restaurants, Kel-D’s, Lee’s Café, and the new Leorose Sunset Beach Bar and Grill. James Cistern is also the home of Stubb’s famous barbecue, now called Tamarind Tree Grill, every Friday and Saturday, which is not to be missed. Other restaurants in the area include Pascal’s at boutique luxury resort Sky Beach Club, Tippy’s (international and fusion), 1648 Bar & Grille at French Leave (fine dining for lunch and dinner), The Rainbow Inn (steaks and Monday night brick oven pizza night) and Da Perk Café (café and sandwich shop). 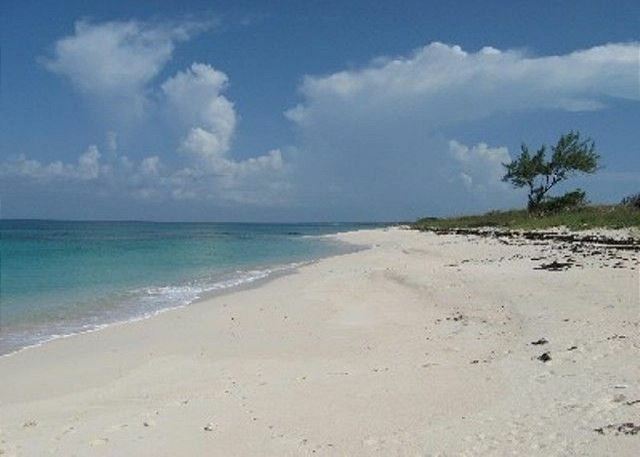 Eleuthera is most famous for its 100 miles of spectacular, deserted beaches. The island, home to just 8000 residents, is safe and friendly. 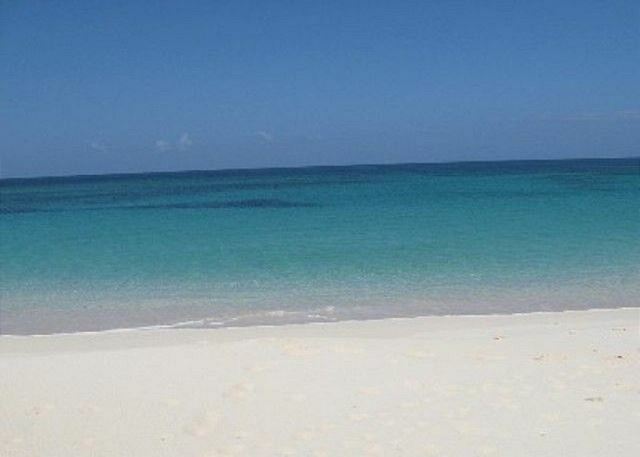 The snorkeling, diving, and fishing on the island are world class. Boating, surfing, and other water sports are also popular. You can rent power boats, sailboats, sea kayaks and bikes. There is excellent sightseeing, as well. 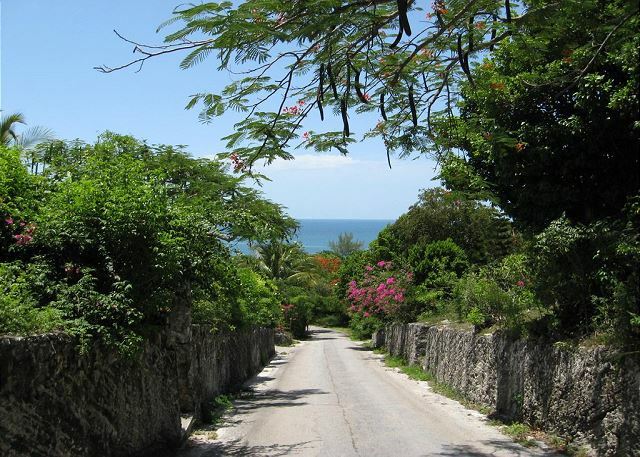 Eleuthera has vast caves, cliffs, a bottomless ocean hole, many unique beaches, historic churches and 19th century homes, and small villages to explore.